Y'know, it's great to have a long list of blogs to read, because most people don't post everyday. And so if you have a lot blogs, a couple people are bound to post. Today's asortment of blogs includes Meg, Wendy, yarnstorm, and Vicky. Also The Purl Bee. 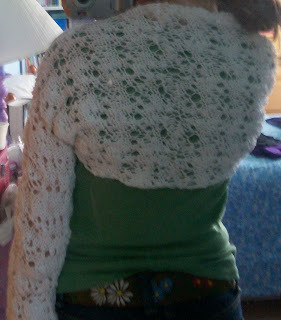 It's the I Do shrug from knitty! 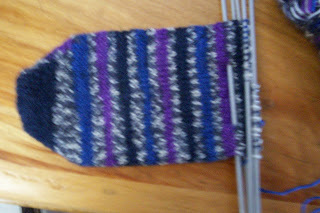 Now I am knitting a Wendy johnson sock! Toe-up, in lion brand Magic Stripes. (sorry, I can't seem to keep the pictures away from the top).